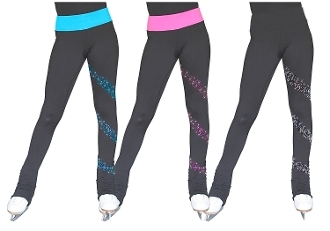 ChloeNoel PS96 Crystal Spiral Figure Skating Pants will give sparkle to your practice. Innovative fabric allows the body's moisture to pass through the garment and resists odor-causing bacteria. Available in several colors from Child XXSmall to Adult Large. Click on images to see color choices and sizing chart.